So, do you fancy yourself as a droëwors specialist? You do? Well then get your meat, spices and secret mixes together and rush in your registration for the Stellenbosch Hills Droëwors Maker of the Year challenge. Freddy Hirsch, South Africa’s foremost spice supplier to the meat industry, has signed up as sponsor for the second year. “We chose to partner in the Stellenbosch Hills annual competition as it combines some South African favourites, droëwors and wine. This competition is ideal for local droëwors makers to showcase their skills using our quality selection of spices and to inspire others to try it for themselves,” said Deanne Nicolau, Group Marketing Manager of Freddy Hirsch. Each year a different Stellenbosch Hills wine is chosen to be the inspiration for entrants and the winner’s droëwors needs to be the best match for the chosen wine. 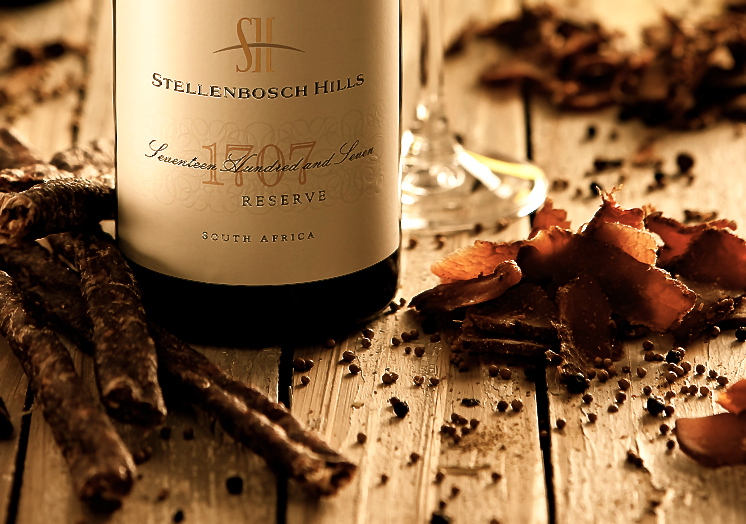 This year the choice of wine is the Stellenbosch Hills 1707 Reserve 2010. Entrants can use any meat for their entries and prizes of R60 000 are up for grabs. Judging will take place during September, after which the top three places will be announced at a gala lunch in November. Prospective entrants for the battle of the best droëwors can order entry packets at a cost of R150. This includes a bottle of Stellenbosch Hills 1707 Reserve, a Freddy Hirsch spice pack, as well as delivery costs for the entry pack. Visit www.stellenbosch-hills.co.za or phone +27 (0)21 881 3828 for more information. Participants must register on or before Monday 2 September 2013. The closing date for entries is 27 September, when 500g of droëwors from all participants must be delivered at Stellenbosch Hills for judging. I’d love to find a natural producer as an alternative to J&M. Hope Stellenbosch Hills starts selling the winner’s goods.